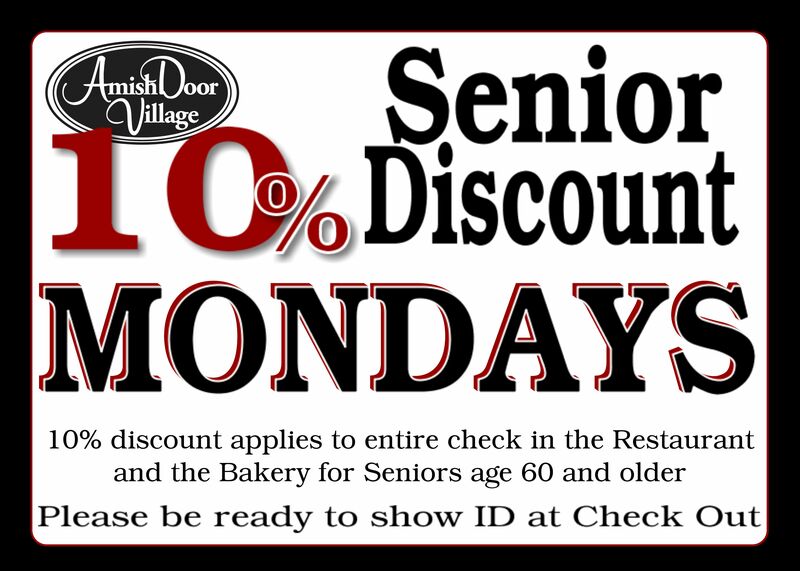 Mondays are Senior Discount Days! The Amish Door Restaurant, first opened in 1977 as a 48 seat restaurant, has grown into the village it is today. A quiet place to stay, dine, shop, and relax! Broasted Chicken, Real Mashed Potatoes, Homemade Bread, and Fresh Pie are the favorites of many diners at The Amish Door Restaurant. We invite you to come and experience the Amish Door yourself. Your favorite may be our Roast Beef Platter or our Buffet or even our Stuffed French Toast for breakfast. Come dine at The Amish Door and let us know what your favorite is! Peace, Quiet, and the Best Views in Ohio's Amish Country. Stay at The Inn at Amish Door and you will be delighted with the warmth of our country hospitality. The perfect place for a getaway, we offer a number of packages complete with a night stay and meal at The Amish Door Restaurant. Fresh Baked Bread, Donuts, Apple Fritters, and Pies. These are just a few of the aromas that meet you as you enter The Amish Door Bakery. We are open early Monday thru Saturday, giving you enough time to stop in and pick up treats on your way to work. An easy drive two hours north on 71, east on US 30 and continuing east on US 250. When you get to Wilmot, follow the signs in! Take 77 South until you pick up 21 South and OH 93 South. Follow US 62 West and watch for the signs to lead you the rest of the way. Follow 77 South to US 250 West until you get to Wilmot. It's that easy. Take US 22 West for about an hour, then continue west on US 250 and keep on as it merges with US 800 North. Take 77 North and head west on US 250. Follow the signs to stay on US 250 West until you pick up 77 North. Exit at US 250 West and keep cruising to Wilmot. Hop on 77 North, then take US 250 West until you find Wilmot. An hour and change. Sign up today for specials, coupons, new shows and the latest updates The Amish Door Village has to offer!